In my last post, I talked about being at the top of your game. One of the ways to get there is through the PADI Master Scuba Diver program. Let’s look at what it takes to become a PADI Master Scuba Diver. For the first three requirements, it’s optimal to complete the PADI programs, but if you’ve completed equivalent training with another agency, that’s okay. 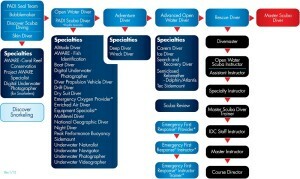 The requirement for five PADI Specialties have to be PADI programs. 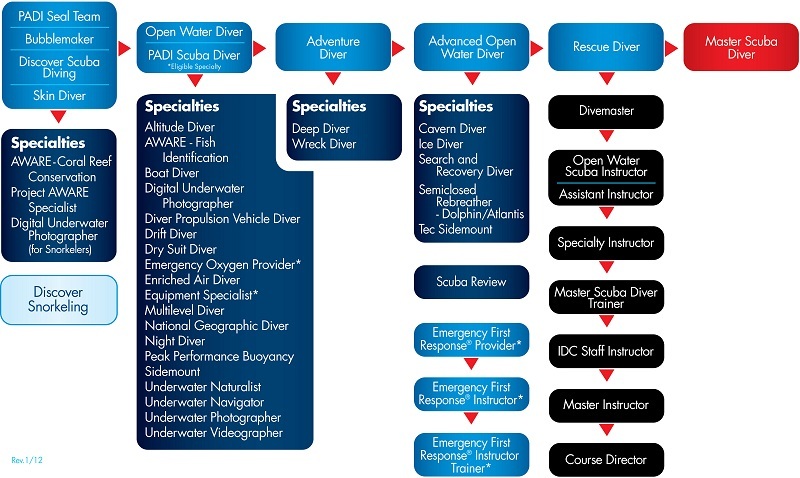 Now, let’s think about what all of these certifications mean and how that puts a PADI Master Scuba Diver at the top of his/her game. In Open Water Diver, you learn the basics of diving safely. This is really a license to learn and definitely not the end of your education. In PADI Advanced Open Water Diver, you’ll complete five(5) Adventure dives. These are the first dive of the correlating PADI Specialty Diver course. Two of these dives are Underwater Navigation and a Deep dive. The other three Adventure dives can be tuned to your interests and what is suitable for the local diving environment. For example, Altitude adventure dive is common in the Intermountain West, Boat adventure dive is common in coastal areas, Dry Suit adventure dive is common in areas with cold water, etc. Think of Advanced Open Water as a sampler of the specialty diving areas, so you can try something before jumping into the full PADI Specialty. Your next step can either be into the PADI Rescue Diver course or continue with PADI Specialties. In the PADI Rescue course, you’ll learn how to prevent and respond to problems. You’ll learn about the psychology of rescue, how equipment can be an issue and techniques to calm a panicked diver, help a tired diver, search for a missing diver and how to provide care to an unresponsive diver. Part of the requirement for PADI Rescue Diver is to also complete a CPR and First aid program. This will often be the Emergency First Response course, taught in tandem with the PADI Rescue Diver course. Looking at Specialties, remember that the Adventure dives you made for Advanced were the first dive for the correlating PADI Specialty Diver course and they count towards the Specialty. For example, if you were to just take the PADI Altitude Diver specialty, it requires two dives. If you completed the Altitude Adventure dive as part of Advanced, you only need to make one additional dive, not two, to complete the PADI Altitude Diver Specialty. Some specialties require more than two dives. Underwater Navigator requires a total of three dives. You complete one as part of your Advanced course. Another way you can approach this is to complete five PADI Specialties. If you include the PADI Deep Diver Specialty and the PADI Underwater Navigator Specialty, you can earn the PADI Advanced Open Water certification. Or, maybe you want to explore other areas of diving that you didn’t look at in Advanced and you want to earn some different specialties—that works, too. Beyond the training requirements, you also need to log at least fifty(50) dives. Those dives can include your training dives, but you should also dive for fun. The dives you log as part of training only amount to about 19 or 20 dives, so you’ll need another thirty dives. You can definitely get those by taking more courses, but it might be better if you go dive with your buddy and practice what you learned in your training. Make some night dives, practice your buoyancy control, go on a live-aboard boat diving trip, practice identifying fish. You took the training to see what divers do for fun, so go live the adventure and have fun. Now that you’ve completed PADI Master Scuba Diver, you’re an ideal buddy. You know your basic diving skills, you know how to help other divers, you’ve practiced specialty diving skills in at least five different areas and you’ve a significant amount of diving experience. Want to do more? Sometimes it looks like PADI Master Scuba Diver is the end of the road, but it’s not. Nor is going down the professional path towards PADI Divemaster. You can do both. In fact, I highly encourage all PADI Divemasters to also become PADI Master Scuba Divers. Why? PADI Divemasters that are also PADI Master Scuba Divers become not only ideal buddies, but ideal instructional assistants because of their experience in Specialty diving areas. Ready to take that step towards PADI Master Scuba Diver? Drop me a line and I’ll help you start planning your path towards PADI Master Scuba Diver.